The Deck and Patio Company can enhance the look of both the front and back of your residence through the use of brick, natural stone, pavers and other landscaping materials. Brickwork and stonework patios, walkways and pool areas have adopted new trends over the last few years. In fact, The Deck and Patio has earned many awards from the “Interlocking Concrete Pavement Institute”, signifying the superior design ability and competence of installation by Deck and Patio’s team of construction experts. Look through out Patio Portfolio Gallery for ideas and read more about patio materials and construction. Decks are commonly used for elevated outdoor living areas, and they can be multilevel to suit the “lay of the land”. 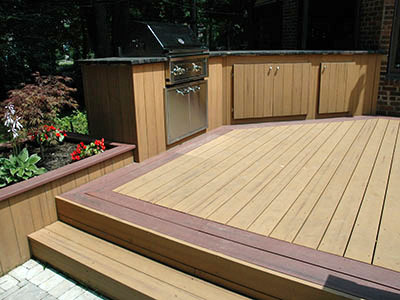 Deck surfaces are available in a variety of materials. Natural wood, pressure treated wood, and composite materials are all possibilities a homeowner needs to consider for their deck. Obviously there are advantages to each, and each has its limitations. 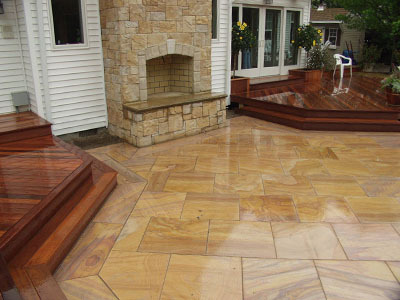 We have designed a wide variety of decks to suit our clients needs, and have won many awards for them. Look through out Deck Portfolio Gallery for ideas and read more about patio materials and construction.